Visit a number of areas that are usually inaccessible and learn about the heritage and significance of Adelaide Oval. Expert volunteer guides share captivating tales of the history of the venue, the sporting greats who have competed here and the Oval’s iconic status in SA. Imagine running onto Adelaide Oval to the roar of a 50,000-strong crowd, climbing the stairs to the 100-year-old heritage-listed scoreboard or gaining an insight into match-day preparations inside the players’ change-rooms – all of these experiences and many more are included on a Stadium Tour. Tours depart at 10am, 11am and 2pm from Monday to Sunday, with an additional 1pm tour available on Saturday and Sunday. Tour operation varies on public holidays and event days, refer to the tour schedule for available dates. 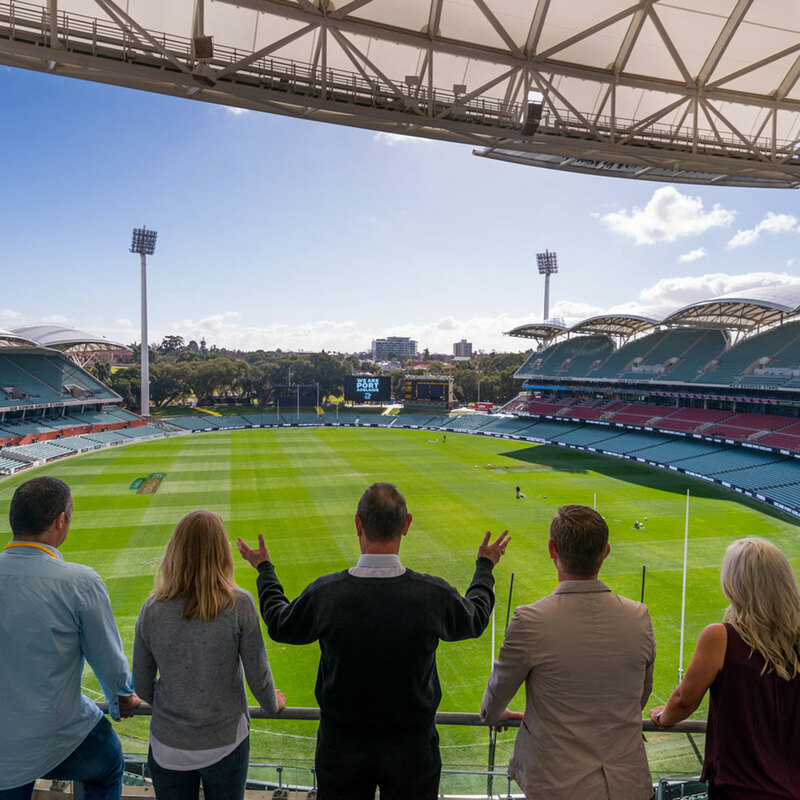 Adelaide Oval Football Members and SACA Members receive free Stadium Tours on presentation of their membership card. Book online via the tour schedule and be sure to bring your card on the day. Adelaide Oval Tours cover up to 2.5km on foot and may include the use of steps, stairs, escalators and elevators. Comfortable, closed-in footwear is required. All areas on the tour, with the exception of the heritage listed scoreboard, are accessible by wheelchair and walking aids. Stiletto heels are not permitted inside the heritage listed scoreboard. 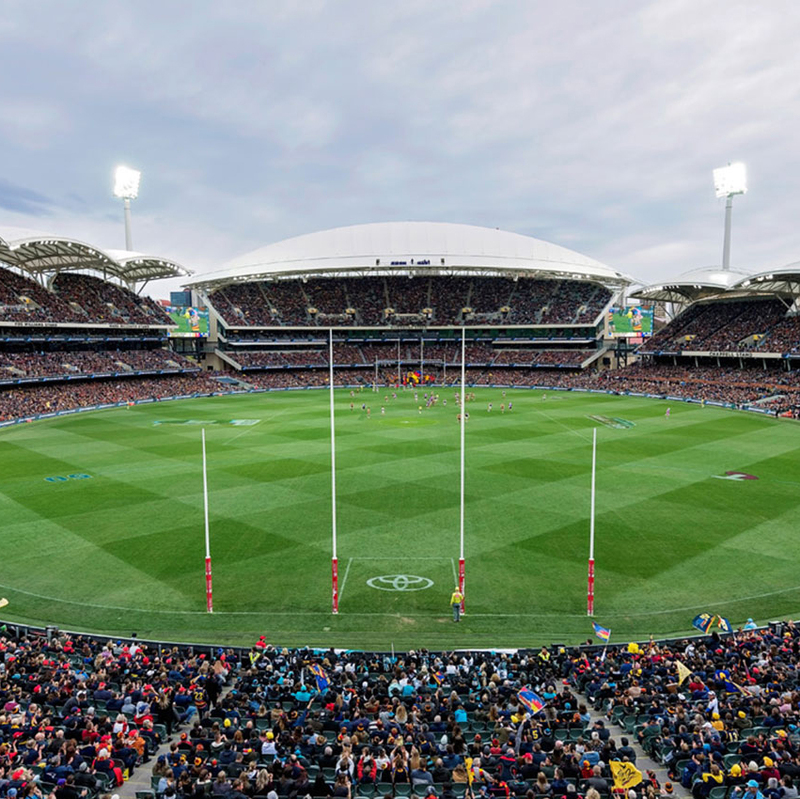 With the commencement of the 2019 AFL and SANFL Premiership Season, Adelaide Oval is giving you the opportunity to go behind the scenes for exclusive access to the stadium’s Australian Football history and facilities. Join us for a 90-minute walking tour and hear stories about the football legends who ‘played by their own rules’. See history come to life with the opportunity to view the Magarey Medal display and take a walk down memory lane through Magarey Grove. Experience the excitement of game day when you step into the coach’s box, change rooms and media facilities. Bookings essential. Please be advised all locations and monuments are subject to availability. 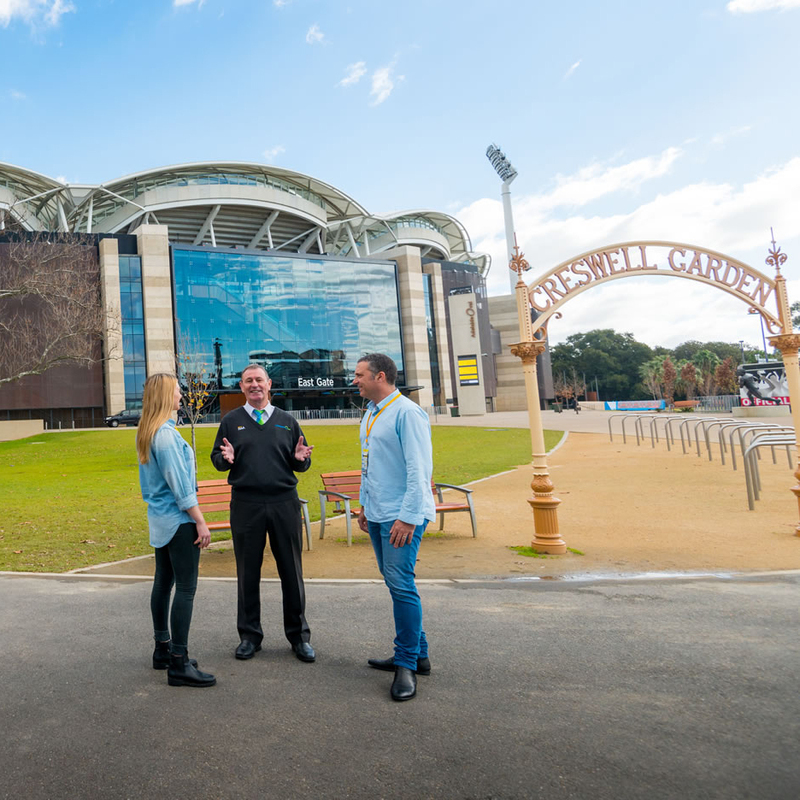 Discover the fascinating history and stories of Adelaide Oval with a guided walking tour visiting sites within and around the precinct. 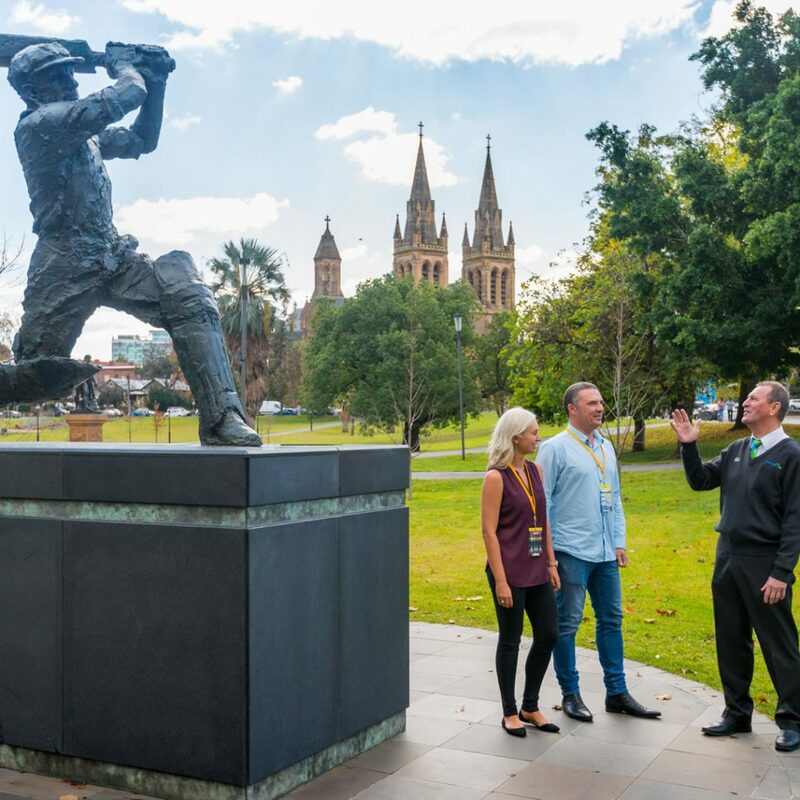 Learn about our iconic sculptures including Sir Donald Bradman, Clem Hill, Russell Ebert and Malcolm Blight while delving into the story behind the Moreton Bay Fig Trees and the sporting prowess of the Victor Richardson. Visit the heritage-listed scoreboard, uncover the many historic and relatively unknown delights of the Creswell Gardens and explore the grandeur of the Western Stand. Group Tours available; please contact our team for further information. Availability: Fridays and Saturdays throughout History Month (May). Tours not available on game days. Come on a journey as we explore the Extraordinary Events that helped to build Adelaide Oval. This light-hearted look at the ‘firsts’ which helped to shape the foundation of the Oval’s rich and interesting history including the first Cricket Match, first Football Match, and even the first boxing match! Find out who bowled a ball through WG Graces’ beard, how the waterlogged pitch of 1923 did not stop North Adelaide’s victory, how Sir Donald Bradman stood up to Patrick Patterson and other fascinating insights into the quirks and oddities of Adelaide Oval. Drink on arrival included. 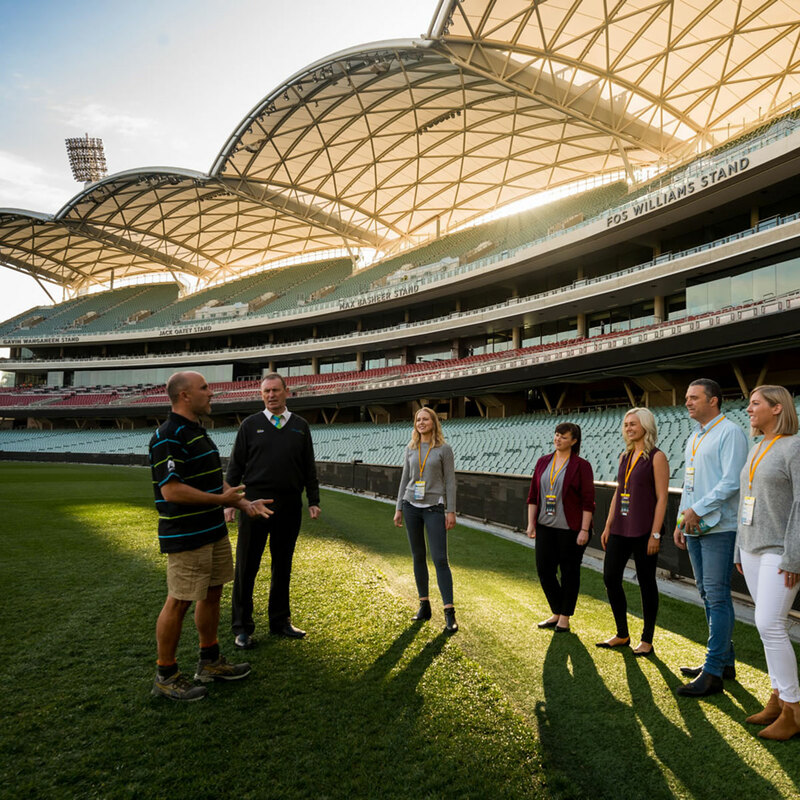 Bespoke group tours are a fantastic way to experience Adelaide Oval with friends, family or colleagues. Private tours can be arranged by appointment for groups ranging from 10 to 150+ guests and can be tailored to suit specific interests or requirements. Complete the group booking enquiry form or phone the Adelaide Oval Stadium Concierge on (08) 8205 4700. If you are a school or tertiary group head to our Education page to book a tour. Pad up and get ready for a fully immersive virtual reality cricket game where you are the batsman and your team is counting on you. Step up to the crease, get your eye in, then hit ‘em for six! 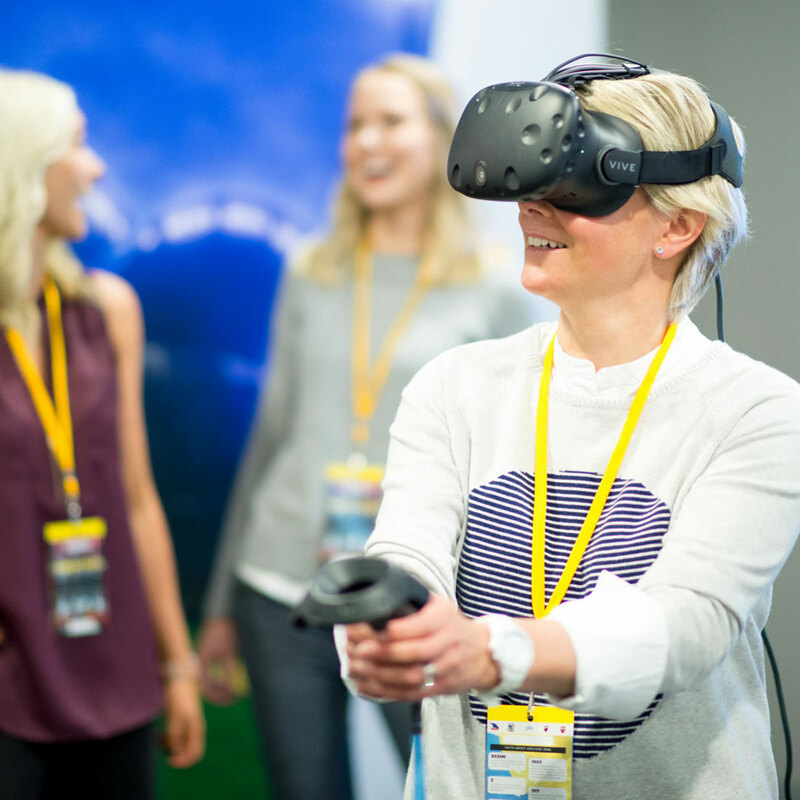 Wearing a custom-designed Vive virtual reality headset and using a hand controller as your cricket bat, you’ll be transported to the sights and sounds of Adelaide Oval’s hallowed turf as the stadium buzzes with anticipation. Are you interested in becoming an Adelaide Oval Ambassador? If you have excellent communication skills, love interacting with people and are enthusiastic and reliable, we want to hear from you! When do Stadium Tours run and how much do they cost? Standard tours operate Monday to Friday at 10am, 11am and 2pm and Saturday and Sunday at 10am, 11am, 1pm and 2pm. Pricing for tours are: Adults $25, Concession $20, Child (5-15years) $15 (valid until 1 April 2019). Adelaide Oval Football Members and South Australian Cricket Association Members are admitted to standard tours free of charge on presentation of their membership card. Bookings are required. Are Stadium Tours suitable for visitors with access needs? Stadium Tours are accessible by wheelchair and walking aids with the exception of the heritage scoreboard. For special requirements or enquiries, please contact Adelaide Oval on 08 8211 1100. Am I able to turn up for a Stadium Tour without booking in advance? Bookings are recommended to avoid disappointment. Please visit the Adelaide Oval Stadium Tours page to make a booking.